Jacob-Abraham- Camille Pissarro was born to Jewish parents of French, originally Portuguese, descent on the island of Saint Thomas in the Danish West Indies. From 1853 to 1855, he spent two years in Caracas, Venezuela, along with the Danish artist Fritz Melbye, experimenting with drawing and watercolour, before moving to Paris in 1855 with the intent to become a professional artist. After a stint at the Ecole des Beaux-Arts, he attended the Académie Suisse, where he met Claude Monet, Paul Cézanne and Armand Guillaumin. 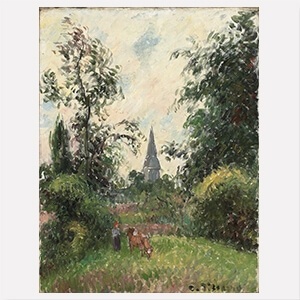 Pissarro is often regarded as the father of the Impressionist movement and was the only painter to contribute to all eight of the Impressionist exhibitions held between 1874 and 1886. In 1866, he moved from Paris to Pontoise, where he occasionally collaborated with Cézanne and Gauguin. In 1882 he left Pontoise for Osny, and finally settled with his wife and children at Eragny in 1884. After meeting Seurat and Signac, Pissarro temporarily experimented with Pointillism between 1885 and 1890. Usually focusing on figural and landscape painting, he produced a series of cityscapes late in his career, depicting views of Paris, Rouen, Dieppe and Le Havre. Pissarro died in Paris in 1903.